Dusty Desert is a stage in Sonic the Hedgehog (2006) for the Xbox 360 and PlayStation 3. As with other levels in the game, it features in all three of Sonic, Shadow, and Silver's stories, although the characters fight their way through the area at different times and for different reasons. A place of windswept dune-wastes and crumbling, sun-bleached ruins, Dusty Desert's heiroglyph-inscribed temples demonstrate quite plainly that the Soleannean's heliolatry goes back far further than the castle ruins in Kingdom Valley. Egyptian-style motifs crowd the walls of the sandblasted temples, with fossilised pteranadons and giant nautili adorning those surfaces that aren't decorated. Occasional bat-inhabited caves and dotted oases provide the only water in the region. This level includes "sand wave" chambers, where sweeping dunes conspire to prevent the characters from reaching the exit. Throughout the interior sections of the level, rising pillars and ancient doors must be activated by pushing various switches. Mission: Escape Dr. Eggman's Minions! The boss, Egg-Cerberus, actually precedes the main level here. Having lost the Egg Carrier's trail over Wave Ocean, Sonic and Tails return to Soleanna Castle Town. They eventually discover that Eggman's holding Princess Elise in Dusty Desert, and smash into the prison complex without delay. Eggman swiftly sics the Egg-Cerberus on them, but even with the boss robot defeated, hordes of Egg Gunners mercilessly pursue. Tails acts as a diversion to draw the robots off, back through Wave Ocean, while Sonic escapes through the desert with Elise. Sonic's carrying Elise throughout this level, which limits his moveset slightly. However, the Princess' mysterious passenger enables her to generate a kind of fire shield, which can both damage enemies and enable Sonic to walk over the otherwise-swiftly-fatal quicksand. Unlike Shadow and Silver, Sonic and Elise don't enter the main ruin complex. After extricating himself from Tropical Jungle following Mephiles' time-travelling inaccuracy, Silver manages to locate the Iblis Trigger in Soleanna Castle Town. Before he can complete his assassination mission, however, Amy Rose repeats her peculiar brand of hedgehog-colour-blindness from Weapons Bed, distracting Silver long enough for the blue blur to vanish. In contrition, Amy offers to help Silver in his search for the Trigger - but first they have to find Sonic (unaware that these two are one and the same). Her "girlish intuition" leads them to Dusty Desert - although, admittedly, she's right, as Sonic did only recently blitz through with Elise. The bleak, arid landscape leaves Silver extremely impressed by comparison to Crisis City, much to Amy's confusion. Silver and Amy only explore the interior of the desert complex, flicking switches in much the same manner as Shadow and Omega. Silver's sections include a set of billiard-like puzzles, where the hedgehog must use a limited number of psychokinetic jolts to knock giant orbs into pits. The puzzle at the end of the stage is notorious for thwarting many players' efforts to achieve a timely S-rank, although a glitch allows the puzzle to be skipped if exploited correctly. After the level, Silver and Amy return to Castle Town, where they finally run into Sonic (initiating Silver's second boss fight). After E-123 Omega machine-gunned Mephiles into a fine mist at the end of the previous Wave Ocean level, said malicious fog drifts over to Dusty Desert, fixated on finding more Chaos Emeralds to facilitate his re-integration with Iblis. Team Dark naturally give chase. The level opens with Shadow piloting a hovercraft through the ruin-strewn dunes. It's quite easy to get lost, crash, and die in the confusing expanse of desert; slowly proceeding between the rising marker pillars is usually the best bet. 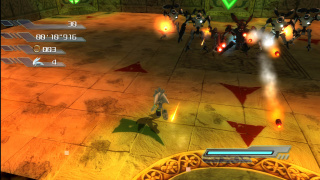 Inside the main temple complex, the player controls Omega, then Shadow again as they blast through the hordes of Iblis monsters in search for the switches which will allow the other to proceed. Eventually, Team Dark reaches the deepest chamber of the ancient complex... but moments too late to stop Mephiles getting his hands on the Emerald. The demigod then attacks as Mephiles Phase 2.